I traveled about 94.5 miles today. This was the sign about eight miles from camp. One more day and I'm in San Francisco! Today seemed to take a long time. 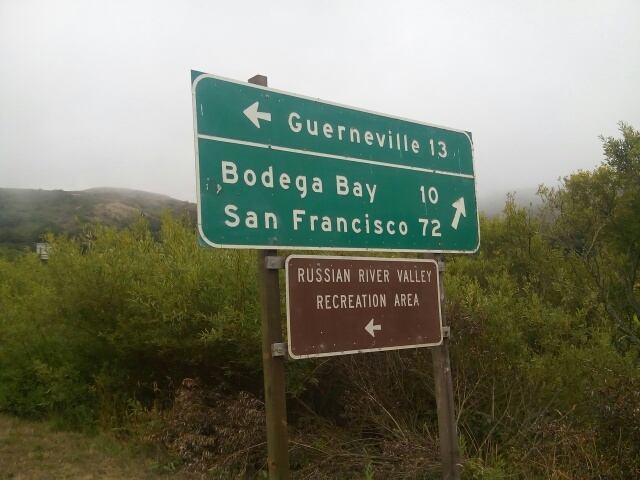 Likely a combination of fatigue, a very hilly road, and the warmth sapping fog along the coast. Just 75 miles tomorrow, and I'm in San Francisco. The coast was beautiful today, and the abundant eucalyptus tree had a wonderful smell when I biked by. As I approach the end of this journey, I am very thankful for all of the people, most of then strangers, who helped me along my way. It's been an incredible and in many ways indescribable adventure (and still will be, for another day). I am, however, ready to be done, and very excited to see my friends in SF. Went to a Mexican restaurant a quarter mile from camp for dinner. Got a burrito, but they accidentally brought me a vegetarian one, so I got that one for free in addition to the one I actually ordered. Yes! Sufficed to say, I was absolutely stuffed by the time I finished eating, but I put both burritos away without too much trouble. That's all for now, time to rest up for the home stretch.